My friend Lisa and I had been planning a big day out to go birdwatching for at least a couple months now, and we almost cancelled it because of the threat of bad weather (I peer-pressured her into it). So on Sunday morning, we met at the Cambridge Rail Station, loaded up her panniers, and hopped a train to King’s Lynn. 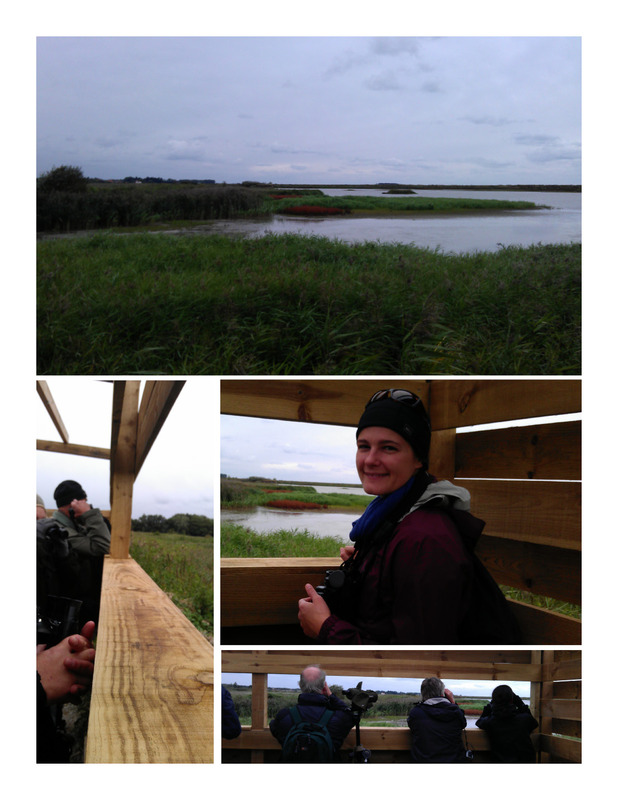 From there, we cycled about 20 miles to the Titchwell Nature Reserve, where I was in nerd heaven for the next four-and-change hours. I was nervous about the cycle, because Lisa is a Serious Athlete and I’m, well, kind of a goof (but I’m getting really good at zumba class!). She also looked genuinely appalled when she realised that my bike is way too good for the likes of me (fair enough). But with Lisa carrying my binoculars and lunch, riding a commuter bike, and leading the way for most of the journey, we more or less kept a similar pace. The only times I got nervous were the downhills, because with my Fat Kid Advantage I would go screaming down the hills and overtake her really quickly, and I would either have to take the wrong side of the road or hit the brakes repeatedly. Still, we made it there and back in one piece. It was my first real birding experience in Britain, which was great, because almost everything I saw, I was seeing for the first time. We saw an avocet about five minutes after we walked it, and I am obsessed with avocets, so my day was made more or less from the moment we arrived. Titchwell Marsh is a series of marshes – freshwater, saltwater, sea – with hides arranged around the perimeter. Yesterday it was jam-packed full of Serious Birders with spotting scopes and some truly impressive cameras. Lisa and I were also there, bringing down the average age by a decade or two. I got so into it – at one point Lisa was really cold and ready to go get a cup of tea and I said “but look at that bird! and that one! and that one!” – she was probably ready to kill me. But seriously. It was amazing. The rain started about 8 seconds before we got back on our bikes to cycle to King’s Lynn. I got a flat tire half a mile from the train station, and then we shivered out of our wettest clothes and had a cup of tea before sprinting to the station and huddling for warmth on the train back to Cambridge. We looked through the book as the train moved south, though, and both of us were shocked to realise how many birds we’d actually seen. Some birds – Canada goose, swan, mallard – were not so exciting. Others were things I’ve been wanting to see for years – avocets, a pectoral sandpiper, a lapwing, and (this was the biggest surprise) three Eurasian Spoonbills. I like shorebirds because they’re super cute, and also usually easy to spot, unlike warblers or small birds that perch high in trees. But we had a phenomenally successful birdwatching outing, even if the trip back was a struggle. I cannot thank Lisa enough for figuring out the route and the train schedule, carrying my stuff in her panniers across 20 miles of surprisingly rolling countryside (it wasn’t mountainous, or anything, but flatter would have been better, at least on the way back…), and being excited about birds in the first place. Freezing train ride aside, I had a really great day.